Bolles Harbor lies at the mouth of La Plaisance Creek, in Monroe Mi. The area was the home of the Potawatomi native peoples. First European contacts were by the French explorers in the late 1600's. The area subsequently became British territory after the fall of Quebec City and finally American in 1783. The area was first settled in the 1790's. During the War of 1812, several significant battle actions took place in the area. One, the Battle of Frenchtown, resulted in the largest loss of American life in a single battle in the War of 1812. Bolles Harbor was established by the Michigan Department of Natural Resources as one of over 80 Harbors of Refuge. 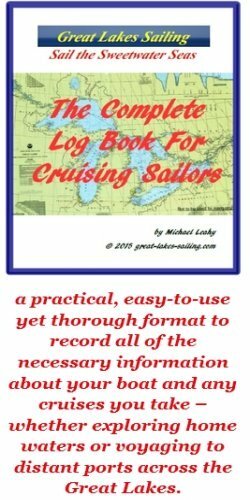 A part of the city of Monroe Mi, within a short distance (3-4 mi/5-7 km) are many services that a cruising sailor want to find. The waters at the west end of Lake Erie can be very shallow. Caution and some careful navigating are necessary if you want to enjoy these waters. The approach into Bolles Harbor is well charted. Entrance is via a 1 nm channel. There is a charted range on a course of 341.5°T. The entrance channel is marked at its outer limit by a Fl RED light. About .75 nm in, the channel becomes protected on the east side by a dike. The corner of the dike is marked with a Fl WHITE light (charted as "10A"), visible approximately 7 nm. Coming further upchannel .2 nm, you will see a 365 ft/ 111 m breakwater on your port, marked with a Fl GREEN light, visible about 5.8 nm. The harbor entrance itself is marked with a F GREEN light visible 6.5 nm. The channel will turn west and the marinas will be on your port side, on the south side of the channel. Navigation Note The United States Coast Guard has advised that there are plans to change the color of the light numbered "10A" from WHITE to RED. As well, they will discontinue the unlit markers numbered "4", "8", and "10". These and other changes can be foud on the USCG Local Notice To Mariners site. Trout's Yacht Basin is on the south side of the channel. They have nearly 100 slips and there may be several available for transient sailors. There is a fuel dock (diesel and gasoline) and a pumpout station. This is a full-service marina, able to carry out mechanical, electrical and fibreglass repairs. There is water and power available at the slips. The marina has restrooms, showers and laundry facilities. There is a ship's store, travel lift and a sailboat spar tower. Monroe Boat Club is west of Trout's Yacht Basin. They have 135 slips with about a 1/2 dozen available for transient sailors on a reciprocal basis. There is no fuel dock or pumpout station. Restrooms and showers are available in the clubhouse. There are picnic areas on the grounds. Harbor Marine lies further up the channel. They have several slips available for transient sailors. There is a fuel dock (gasoline only) and a pumpout station. This is a full-service marina. They can carry out complete engine and mechanical maintenance, fibreglass and woodworking repairs as well as prop repairs. There are restrooms and showers. Hi-Lite Super Market is about 3.5 mi/5.5 km NW of the harbor. They can handle reprovisioning requirements. Monroe Bank & Trust is about 3 mi/5 km west of the harbor. It has counter and ATM service. Mercy Memorial Hospital (734) 243-8519 is located 4.2 mi/6.8 km north of the harbor. HomeTown Pharmacy (734) 243-5656 is located about 3 mi/5 km west of the harbor. Bolles Harbor Cafe is located right at the harbor. It is popular with locals and visiting sailors. Open for breakfast, lunch and dinner, it has a classic family restaurant-style menu - including those Lake Erie perenial favorites - perch and walleye (pickerel). Also at the harbor is Harbor Inn and Ale. Popular as well with visiting sailors, it has an extensive menu featuring steaks, seafood and dishes that have a definite cajun influence. Further into Monroe, you will find a variety of restaurants and pubs. Michigan Bar & Grill gets great reviews for their food. Dolce Vita Italian is a very popular Italian restaurant. At the very end of Lake Erie, Bolles Harbor is a pleasant place to visit. It is quiet yet only a few minutes from a busy urban area. Monroe is proud of its history and there are monuments to the War of 1812 battles and to its famous native son, MGen George Armstrong Custer who grew up in Monroe. During July and August, the River Raisin Jazz Series takes place over a number of weekends. This is a major music program drawing jazz musicians from across the country. For car buffs, there is the Hot Summer Nights Car Show in July. The Monroe visitors site has an extensive list of things to do and see while visiting Bolles Harbor.